Anishnawbe Mushkiki delivers holistic traditional programs in a culturally appropriate manner, which reflect Indigenous culture, values and traditions. 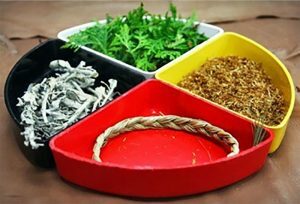 Our traditional wellness tenets are to promote individual responsibility for health and lifestyle, to have respect for others and for one’s own personal integrity and to apply and practice values of acceptance and empowerment while understanding human growth and development as it pertains to all of the Seven Grandfather Teachings. Our traditional wellness team arranges traditional healers and alternative health therapy services integrated with our primary healthcare clinic, coordinates a variety of cultural events and workshops, such as medicine picking, beading, men’s and women’s sweats, and craft classes and offers a variety of support groups. Please note, when visiting a traditional healer, it is encouraged to bring a small offering of tobacco. Tobacco is also available at Anishnawbe Mushkiki for this purpose. Please ask when checking in, if needed. These medicines together make up the four sacred medicines and are used in ceremonies to purify. kindness which flows from the north. Cedar is used to promote honesty and it flows from the south. Sage is used to get-rid of negative feelings. It produces the gift of sharing, which is from the west. We support and empower families and communities committed to preserving their culture and to living a balanced, traditional way of life while achieving optimal health and social well-being. Anishnawbe Mushkiki provides culturally safe, comprehensive care empowering patients through their health and wellness journey. We offer health promotion, primary and traditional approaches to patient and family centred care. Many of our programs are provided in partnership with other organizations in locations throughout Thunder Bay.